"HELCO believes that there is clear directive ... evidenced by strong government support for geothermal development ... recent interest by geothermal developers and advocacy groups, and a positive trend in public support for renewable energy.... on June 22, 2011, HELCO issued a Geothermal Request for Information.... One of the key outcomes of the RFI was that geothermal developers advocated pursuing an expedited competitive bidding docket schedule ...."
HELCO's letter suggests that it was going forward with the new geothermal RFP due to political pressure. On February 28, 2013, HELCO issued the RFP. 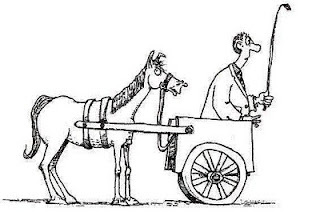 One of the points made by a July 13, 2013, letter from Puna Pono Alliance (PPA) to HELCO, objecting to the RFP, was that HELCO was 'putting the cart before the horse' by yielding to political pressure without first completing adequate planning. Things began to change as the RFP process went forward. Strong public opposition to building a new geothermal facility emerged and led to a demonstration at HELCO in August of 2013. On September 9, 2013, the final report of a study of geothermal health and safety issues was delivered to the Mayor and published. The study report, funded by the County of Hawai`i, said “events during the HGP-A era and during the 1991 blowout provided exposures associated with adverse health effects.... Risks from geothermal energy production in Lower Puna exist.” Those and additional factors (such as rapidly decreasing solar energy costs) affected the political climate. On February 21, 2014, the RFP Independent Observer told the PUC “it is apparent to us that the continued delays in the RFP are due to HELCO ‘putting the cart before the horse’ by not having performed sufficient planning before the issuance of the RFP.” A long term integrated resource plan (IRP) prepared by HELCO's parent company was rejected by the PUC on April 28, 2014. On June 4, 2014 (according to a post on HELCO's geothermal website) HELCO (responding to a Public Utilities Commission Order) provided an action plan that includes a proposed schedule for Best and Final Offers from geothermal bidders. HELCO says “the purpose of the Geothermal RFP is to obtain cost-effective (meaning at a substantially lower system-wide cost to the customer) geothermal Dispatchable energy” – that is, HELCO will take only as much electricity from a new geothermal plant at any given time as is required by fluctuating customer demand. Further, “a new geothermal facility will be required to ... enable the continued integration and management of intermittent renewable resources, such as wind and solar power” – meaning as more solar electricity becomes available from rooftop photovoltaic, HELCO would be taking less electricity from a new geothermal facility. Prior geothermal activity in the Pohoiki area of the Island of Hawai`i has caused serious community harm, resulting in successful lawsuits by more than 100 residents. "We want Hawaii Electric Light Company (HELCO) to stop its contract for new geothermal development on the Island of Hawai`i because (1) the contract was excluded from the utility's recent public planning effort and (2) previous geothermal sites on this Island have been notoriously unsafe, unclean and poorly regulated." A March on HELCO on August 17, 18 & 19 successfully demonstrated community opposition to geothermal development in the present situation (including continual PGV upset events, lax regulation and poor planning.) Hundreds of people participated both by marching for three days from Pahoa to HELCO's Hilo headquarters and by joining the demonstration at HELCO on the final day, Monday, August 19th.